Hen Harrier Locally Led Agri- Environment Scheme. The Hen Harrier Project are the lead partner in a consortium appointed by the Dept. of Agriculture, Food and the Marine to design and run the Hen Harrier Locally led Agri-Environment Scheme. The other partners in the project are the Golden Eagle Trust and Brendan O Gorman Accountants. Fergal Monaghan from the yourcommonage team is the new project manager for the delivery of the Hen Harrier programme. The Hen Harrier Project will be based in Oranmore, Co. Galway. The head office is supported by regionally based Project Officers. To help design and test the new approach, a group of 12 development farmers have been selected, spread across the 6 Hen Harrier Special Protection Areas. The development of effective and practical opportunities for farmers in the SPAs cannot be done in an office. The project must be built from the ground up. The development farms give the project the ability to design and test their proposals at farm level. The farmers themselves supplement the project teams skills and capacity and give a unique insight into the issues at farm level. The Hen Harrier Project will give farmers in the Hen Harrier designated areas an opportunity to earn an additional income from their lands. It will recognise and reward their role in delivering important environmental services. The project will support habitat enhancement and let farmers share in the environmental dividend that this delivers. These supports will be in addition to GLAS. We at yourcommonage support this new direction in the delivery of agri environmental opportunities to farmers and wish the team the very best for the future. 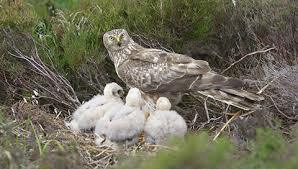 Support Fergal and the team by following the Hen Harrier Project on twitter. You can get there by following this link.